Vatican City is one interesting place. There are many things we do not know about this place with the architectural wonders of the world! Did you know Vatican City is the smallest country in the world and ruled by the Bishop of Rome?! I was surprised to know that the postage stamp of Italy is invalid here in this church complex! And its post box is painted Yellow! This independent state comprises of St Peter's Basilica, Sistine Chapel and Vatican Museum. This article is all about the awe inspiring grandeur of the Basilica! St Peters Basilica is not only has religious importance but is one remarkable work of Renaissance architecture. Being one of the largest and greatest churches in the world this basilica was designed by then greatest architects of Italy and took over 100 years to complete. It seems the original 4th century church was built on a burial ground, right over St Peter's grave. Baldacchino is a monumental bronze canopy over St Peter's tomb and directly under the magnificent dome of Basilica. This bronze structure was designed by Bernini, a greatest artist of 17th century. Do you believe that the baldacchino is about 100ft high and is made of about 100,000 pounds of bronze!? 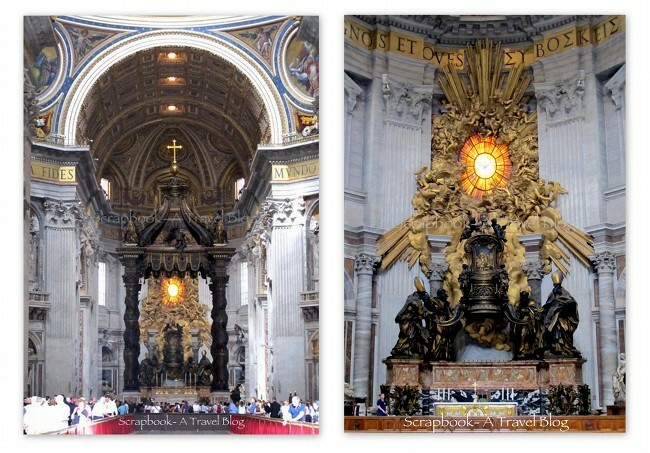 Cathedra Petri (The seat of St Peter) is a monument- another creation of Bernini to honor the actual chair of St Peter. Above the chair is Gloria circled by golden clouds through which the light enters. As you enter the basilica wondering about the massive embracing colonnades, walk towards the baldacchino you see the (divine) light surrounded by gold! Wonderful! There is a bronze statue of St Peter's in sitting position holding the key to the kingdom of heaven! Visitors touch the feet of this statue hoping he allows us to enter the heaven! There are four statues of basilica's holy relics on the four pillars that support the massive dome, popularly known as Crossing Sculptures. Among these statues placed in beautifully ornate niches only St Longinus was sculpted by Bernini. The central dome of the basilica dominates the skyline of Rome along the river Tiber. Why not? It is one of the largest domes in the world! Entire interior of basilica is lavishly ornate with marble, sculptures and intricate mosaic art. You see the dome in the above picture and the art speaks for itself right? There are more magnificent tombs and remarkable structures to see and know. But in the package tours guides rush and push. It is sometimes scary to lose track of our guide in a foreign country especially when you have paid in euros for his services! IMO, this enormous volume art cannot be completely enjoyed in one day rushing around. If I could I would visit and revisit for days! In Rome, err well, in Vatican City and not talk about Michelangelo? Not possible huh? Pieta, one of Michelangelo's masterpieces is protected behind a bulletproof glass! The sculpture is interesting that mother Mary looks very young woman to be mother of 33 year old Christ. The sculpture was damaged by a mentally ill man and so now is protected behind the glass! Did you know that? Sistine chapel also has some wonderful paintings on its ceiling but, photography is not allowed inside the chapel. I saw many tourists taking pictures though :( It is unimaginable how could anybody paint such exquisite figures with such great precision on a ceiling! It was difficult to digest so much art and architecture in a day! I was mesmerized by the volume of art and was sad I couldn't be there for more time. And that was my first day in Italy! it is almost too good to be true. Very detailed pictures, brought back lovely memories of my visit to the Basilica. There can be no end to end to photography here. I was so glad they permitted photography. Thanks Indrani. Yes, you lose count of pictures you have taken! Oh, I do agree with what the others have written, Kusum!! Awesome! 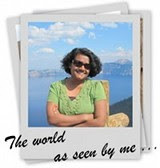 I particularly agree with Indrani, your pics took me there, too! Superb!! Thanks for sharing!! Very impressive - awesome shots! I agree with you. It is an incredible place to visit. I was overcome by the beauty of the Pieta. I feel extremely fortunate to have seen this masterpiece. Such brilliant architectures! Loved them. You have captured them so beautifully. It is incredibly impressive - very nice shots. 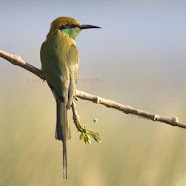 Kusum, you write and photograph very well. You also told us many things that i still don't know. When you are there, it is not possible to remember anything and writing them will take so much time. A relative toured me there, so i just engulfed with my eyes and hoped to remember something later. Imagine, i only have a Cybershot Sony point and shoot, and its impossible to put justice of the works in my shots, they are dark! hahaha. Let us go back there! Thank you! Yeah, sometimes it is so difficult to remember things that guide explains. Well, even these pictures were taken by an high end point-and-shoot camera. I purchased it for this package tour! I was sure the heavy SLR camera gear would be a burden when running behind the guide!